According to the Mayo Clinic, “Acne is a skin condition that occurs when your hair follicles become plugged with oil and dead skin cells”. If you ask me, it’s a dirty four letter word to most of us who struggle with it. Acne is embarrassing, emotional, annoying, and over-all a pain. And – while I am complaining about it, why do we always have to have a huge breakout or enormous cyst appear, you know right smack in the middle of your forehead, right before a big event? Ugh!! Hold on………. I just had to go wash my face and use my toner as I could feel the “hair follicles become plugged with oil and dead skin cells” as I was typing this. Acne, oh acne. You can be so difficult to treat. Most of the time, but not all of the time, you begin in the teenage years and start in the T-Zone with little ‘innocent’ white heads and black heads (closed and open comedones). If we are lucky (and have genetics on our side), you stay mild and can be easily treated with over-the-counter products such as those that contain benzyl peroxide or salicylic acid. Unfortunately acne, many times you progress. You progress into pustules and papules and later into inflammatory lesions known as cysts and nodules. You move from our teenage years right into adulthood, thirty percent of the time for females. Sometimes you give us the false security that we coasted right through our teen years with beautiful, flawless skin just to show up in our 20’s, 30’s, 40’s and even 50’s. Sometimes you go by other alias like acne rosacea, but none the less you sneak up on us. Ok, enough ‘talking to acne’. I want to talk to you. Acne is tough. Not one type of therapy works for everyone and sometimes it is trial and error. Based off your history and skin type, we as practitioners follow guidelines to provide the most likely form of successful treatment but it does not always work first time around for various reasons. This can cause frustration and lead to non-compliance. Most acne topical or oral agents may take 4-12 weeks to see improvement in the skin. To treat acne well, you must be compliant with your acne therapy. 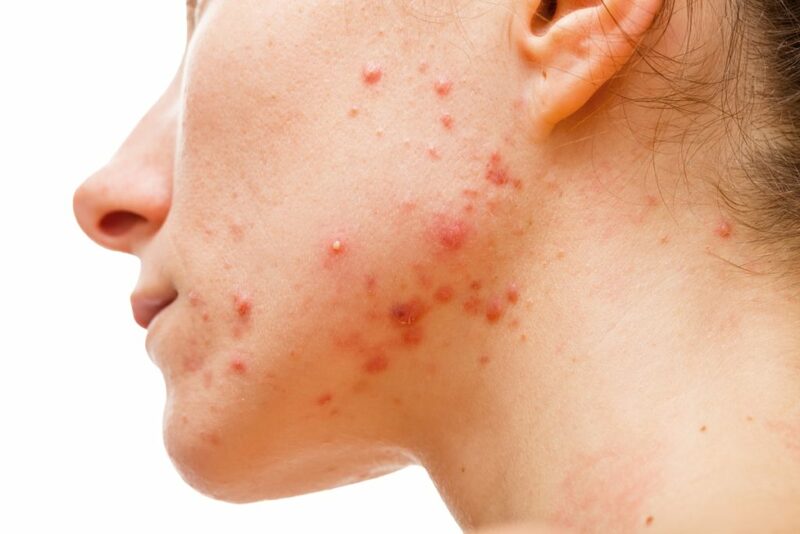 When the therapy is working and the acne has diminished it is easy to think you don’t need to stay on your regimen but because acne is a chronic skin condition, one must continue. Besides traditional prescription creams, antibiotics, and other oral medications, what else can be done for acne? One therapeutic option would be receiving acne treatments. Acne treatments are a process of deep cleansing and exfoliation of the dead cells and plugged oil followed by steam and extractions. Yes, extractions. We pop your pimples for you, but we do this in a way it is less traumatic, the entire pore is clean and you do not scar. Acne masks or acne chemical peels can be added into the treatment as well for further treatment based on need. An acne peel is usually a low-level chemical peel, such as a salicylic, that is applied to the affected areas to help promote further exfoliation of build up and treat the lesions. There usually is a small amount of “down time” where your skin may be a bit red and peeling, kind of like a mild sun burn after a few days. Deeper-level peels are also very useful in the treatment of acne but do come with more peeling and down time. There are also various lasers and light devices available for the treatment of acne. Most of these work by inhibiting bacterial growth within the over produced oil. Generally, multiple sessions are needed, about four to six – and then your maintenance regimen must be continued. Some of these devices may actually help restore some collagen as well to help with acne scars. We offer this type of therapy here in our Cary, NC office. At Azura Skin Care Center, we take treating acne seriously and would welcome the opportunity to assist you in becoming clear and regaining the confidence you desire. Call us at 919-307-8033 to schedule an appointment with one of our providers and let’s get started!